Rina's Rainbow: F1 Hotel Photo Contest! 4 Days Left!!! 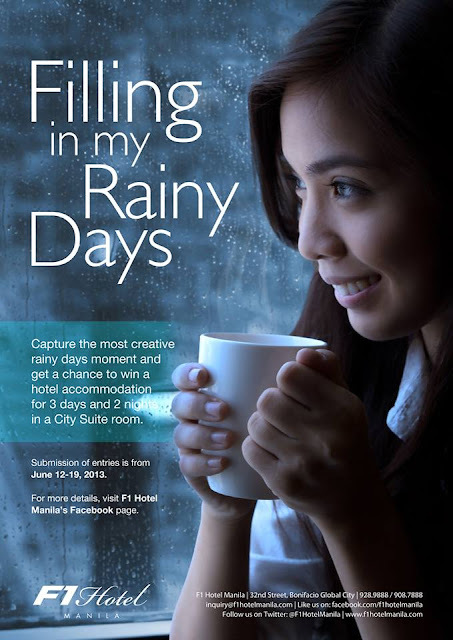 Set-up your DSLR's aperture and shutter speed because F1 Hotel Manila is launching a photo contest! Check out photo description for more details. 7. 2 Runners-Up will each win 1 voucher of an overnight accommodation in a Deluxe room with buffet breakfast for 2 and their winning photos will be displayed at F All Day Dining Restaurant. 8. The photo with the most likes & shares on Facebook and re-tweets from Twitter (plus the added points from other social media accounts) wins. 9. Submission of entries is from June 12-19, 2013. 10. Announcement of finalists is on June 21, 2013. 11. Announcement of winners is on June 30, 2013.